Judah saw Joseph falsely accusing the brothers of such crimes as theft and espionage. It could be that they angered him, and if so, they would have to appease him. “You are like Pharaoh” then means that “You are as important as Pharaoh.” Secondly, Joseph might have been a despot who wished to harm them, and they would have to fight. According to this, “You are like Pharaoh” means “If you anger me, I will kill you and your master, too.” Finally, the brothers might have sinned against G-d, and G-d had told this leader to persecute them so that they could repent. This leads to the third meaning: “Take care not to be singed by our fire, lest you be smitten by leprosy as was Pharaoh after meddling with our great-grandmother Sarah.” As intelligent as Joseph was, conclude our Sages, Judah nevertheless gained the upper hand. This battle between the two brothers has great significance. Judah and Joseph were the two principal leaders among the brothers. They are both enraged. According to the Zohar, they both tremble with fear that they will have to kill or be killed. But this confrontation turns out for the best. The establishment of harmony within the family and in society is conditioned by the union of temporal power (represented by Judah, the father of the royal tribe) and spiritual power (represented by Joseph the Righteous). Indeed, no source of blessing is more beneficial to man than that which emanates from the alliance of royalty and the fear of G-d. Indeed, according to Rav Yonatan, the angels themselves descended from heaven to be present at this furious combat between the lion (Judah) and the ox (Joseph). Finally, Joseph cannot take it any more and reveals his true identity to his brothers. This revelation is made in private, and under great emotional strain. His first words were “I am Joseph”. This throws everything into disarray. A stunned silence pervades the air. Why? 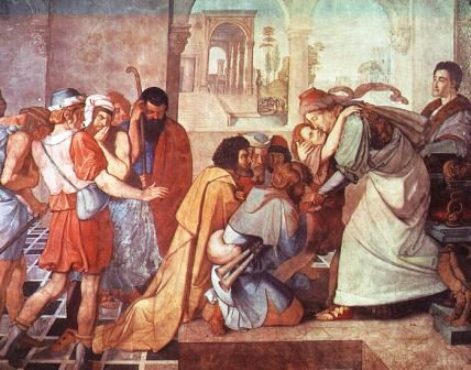 The brothers had always considered themselves absolutely right in their treatment of Joseph. They had a whole series of legal motives and justifications, and little by little they had become convinced of their complete innocence in the sale of Joseph. Now, when the hour of truth came, 22 years later, they needed only to hear him utter “I am Joseph” and they were petrified. This simple rebuke abruptly tore away the veil of falsehood and the brothers suddenly realized the inanity of their excuses and pretexts. The whole beautiful ‘system of defense’ that they had built up over the years suddenly crumbled. All our good reasons which we use to exonerate ourselves cannot withstand the blinding light of truth. What will it be like then on the day of supreme judgment, when G-d will ask us to account for our deeds? The first question Joseph asks his brothers is “Is my father still alive?” Why does he ask this, if the brothers have consistently mentioned that their father was well? Joseph was afraid that they were just saying that he was well because up until then they had been under pressure of interrogation for espionage. Now he was asking them as a brother; he knew that they would tell him the truth. The brothers were in a state of shock. Could this be their kid brother that they had sold into slavery? Joseph asked them to come closer. Had their disconcertion been out of fear, they would have fled, but it was out of shame. His request for them to draw near calmed them down. He tells the brothers to bring his father and settle in the land of Goshen. Why did he choose this land? Firstly, Goshen is on the Egyptian border, adjoining Israel, and therefore Jacob would not have to leave Israel. Secondly, Goshen was given to Jacob’s grandmother Sara by Avimelech. Thirdly, Egypt was entirely settled except for Goshen. Joseph would therefore not have to relocate any Egyptians to make way for his family. Joseph then falls upon Benjamin’s neck and weeps. The others look on. What about the other brothers? Joseph (who came from the same mother as Benjamin) cried on his neck because he thought of Benjamin’s suffering from Leah’s sons when he was small and alone, with no one to defend him. Benjamin wept upon Joseph’s neck for all Joseph’s suffering as a slave and as a prisoner. The Midrash gives us another reason. Joseph saw (with prophecy) that the first and second temples built in Benjamin’s portion would be destroyed, and Benjamin wept because he saw that the Mishkan of Shilo, in Joseph’s portion, would be destroyed. The others, however, did not suffer from Joseph’s absence. Unlike Benjamin, they had participated in selling Joseph, and wanted to get rid of this ‘dreamer’ forever. Joseph therefore kissed them and wept with them, too, in order to reassure them, but he didn’t ‘fall on their necks’. When Joseph gets to meet Jacob, though, he ‘wept on his neck excessively’. Jacob sets off to meet Joseph in Egypt. On the way there, he stops in Beer Sheba to slaughter sacrifices, in the same place that his forebears had sanctified, in order to ask Hashem for permission to go to Egypt. He also went to harvest the eshel trees which Abraham had harvested there. What was the reason for this? Joseph was now supporting the whole world. Jacob asked himself, “By what virtue did my son merit to sustain so many people and attain such great honor?” When he got to the eshel tree, the place where Abraham had provided free food, drink and lodging for travelers, he understood that Joseph’s unique position was a reward for the hospitality afforded by Abraham. Our Sages add, “When someone is charitable, G-d provides him with the funds to do even more”. In addition, the wood from the eshel would be used to make the central beam for the Mishkan. This beam would unite all the Mishkan’s planks into a single structure. This symbolizes the unity that Jacob desired for his sons. Jacob sends his son Judah ahead of him to Egypt. The Midrash tells us that Judah’s mission was to establish a yeshiva there, to prepare for Jacob’s arrival. Jacob did this to prepare a place of holiness in the impure land of Egypt, so that G-d’s Presence would have somewhere to dwell. But why did Jacob choose Judah for this task and not Levi, (the Jewish people’s future teacher of Torah) or Yissachar, whose wisdom the Torah praises? The answer is that Jacob had already decided to hand over the leadership to Judah, and wished to teach him a lesson about government: that religion and state must not be separated. It is the king who must see to spreading Torah and observance amongst the Jewish people, and it is he who must go before the people, teaching and establishing yeshivot. We have already said that Joseph fell on his father’s neck. But Rashi tells us that Jacob did not respond as such, because he was busy saying the Shema. Why pray at this moment? We are told that as Jacob approached Egypt, he greatly feared the temptation of the Evil Inclination. There are three remedies for this: Torah study, Shema, and recalling the day of one’s death. Jacob adopted all three remedies. 1 Esau said to Jacob, “If you don’t let me exit the womb first, I will kill my mother and exit through the stomach wall.” Saying “This one is a murderer from his inception”, Jacob allowed Esau to emerge first (Midrash Hagadol, Bereishis 25:22). 2 Jacob was born circumcised (Avos d’Rabbi Nosson 2:5). 3 Throughout the time that Jacob was in Lavan’s house, G-d did not speak with Jacob (Tanchuma, Vayeitzei 21). 4 600,000 angels rejoiced and danced before Jacob when he left the house of Lavan (Shir Hashirim Rabbah 7:1). 5 Because Jacob went with Esau on the same road, all Jacob’s sheep, cattle and goats died. He had nothing left but a single one-year old lamb in the merit of the Patriarch Abraham (Otzar Hamidrashim 38). 6 If the people of the world knew what a high level Jacob was on at the time that G-d told him, “I shall descend with you to Egypt”, they would have licked the dust for three parasangs around his grave (Zohar 2:5a). 7 Within seven years, eleven sons and daughters were born to Jacob (Yalkut Shimoni, Vayeitzei 25). 8 Jacob’s sons treated him with respect. They tended the flocks while he sat in yeshiva (Sechel Tov, Bereishis 34:5). 9 Until Jacob, there was no illness prior to death. Jacob came and prayed, and there was illness [allowing a person to prepare better for death] (Bava Metzia 87a). 10 Jacob rebuked his sons only when he was near death (Sifri Devarim 2).